Just a couple weeks ago, when I originally wrote this post, I'd had no particular thoughts about putting up a blog related to WirelessVisibility.com. Since what I wrote pertains precisely to the subject matter of this blog, here is that post in full as my initial post here. It was less than two weeks ago that I joined the legions of smartphone users. Until then, I'd been quite pleased with my Motorola RAZR V3xx. It was reasonably compact, being a clamshell design. It could look at my gmail, it could text, it could look at Google maps and, within limits, it could even navigate the web. Plus, it was rugged. I know that because I had dropped it many times, usually on hard surfaces. Thank you, Motorola. But, my RAZR wasn't a "smartphone." That's what I needed. I was even willing to switch from AT&T after 17 years to get what I wanted. 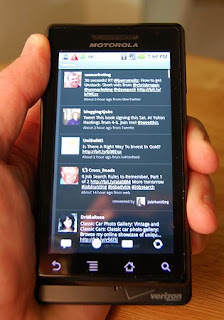 Smartphone design has continued to escalate since the early Blackberrys and Palm phones. The real landmark in smartphone design was the introduction of the first iPhone design in June of 2007. With the iPhone, smartphones became accessible to more than the corporate users and avid texters. And the uses of the smartphone grew exponentially with the availability of apps (software applications), many of them free, particularly those that Apple made available for followers to install on their iPhones. Three years after the introduction of the iPhone, I've finally caught up. Last year, there were 47 million smartphones shipped in North America alone. This year, the analysts are expecting the number will rise to 65 million. RIM (Research in Motion, maker of the Blackberry) is still the market leader, but the iPhone and the new Google Android-powered phones are slowly eating away at its market share. My phone of choice is the Motorola Droid. It's a bit newer in design than the iPhone and uses the Android operating system, as do a number of other new smartphones. Even though one of its primary duties is as a phone ("Hello." "Hello! How are you." "I'm fine thank you." Remember that? ), I really view it more as a "mobile computing platform." Nevermind. Its usage as a phone is almost secondary. Now, "mobile computing platform" is the heart of the smartphone story. These little devices are taking that concept to a higher and higher level. My phone is GPS-equipped, so it can locate me, as precisely as within a couple meters, almost anywhere on Earth. It can act exactly like a dedicated in-car GPS complete with turn-by-turn navigation and voice directions. It connects to the Internet, so it has access to almost boundless information. It displays websites with good fidelity and will soon have a Flash player, unlike the iPhone. It has voice translation, so I can have my spoken English converted to a number of other languages, even that of the Droid itself (or vice-versa). Through many of the available software applications, it can "mash up" data to give me information about the restaurant I'm standing in front of or tell me the names of the constellations I'm looking at in the sky. It can scan the barcodes of food products and tell me their nutritional value or scan the barcodes of electronics products and tell me where I can find the cheapest price. It can take pictures and post the images to the web or shoot video and stream what it sees to another user. And that's just getting around to its use as an entertainment machine. It can play music from MP3 files on the phone or from Internet websites that stream music. It can play video from YouTube and networks like CBS and even play movies from Blockbuster (coming soon). Sorry, I have to add two more: flashlight and compass. Canteen? NO! I don't think I'm done, but I will stop. You get the idea. The smartphones can do everything but production work, like running Photoshop or Excel or web development or writing (like this) requiring the speed and relative ease of a real keyboard. I'll be darned. Eric Schmidt was right. Watch the video I posted of his speech, if you haven't already. Computing doesn't mean just desktops and notebooks anymore. More and more, it's mobile computing taking the center stage. If you run a business, you really have to think about how this affects you. Can you be found? What's your reputation? Millions of buying decisions are going to be made by people with smartphones in their hands. I think that's a great start for this blog ... prewritten by me.